Lighting A Revolution: Ink Blotter 153, "Edison Mazda Lamps"
Blotter number 153; image number: LAR_B153. During the 1920s many artists, including Maxfield Parrish and Norman Rockwell, painted images for use in General Electric advertising. Artwork contracted by the company adorned calendars, matchbooks and the backs of playing cardsand ink blotters. 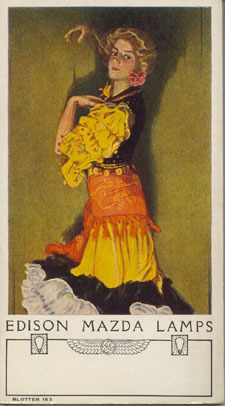 The blotter with this colorful Flamenco dancer has no text other than the brief titleno sales pitch, no description of product, just images. The dancer catches the eye, while two light bulb silhouettes and the unusual winged GE logo reinforce the title. The space at the bottom (as seen on many of the blotters) is left for the local lamp seller's imprint. This blotter is unsigned and experts who have seen this image doubt it is the work of either Parrish or Rockwell. However, a correspondent who wishes to remain anonymous suggested that this blotter may be the work of artist Clarence Coles Phillips (18801927). "I can't prove it, but [Phillips] did a 1921 ad for Mazda that has a number of similarities. Another of his paintings was used in a Mazda calendar. ... On page 30 of All American Girl: The Art of Coles Phillips by Michael Schau there is a photograph of Phillips painting in his New York studio in 1924. He is seated at his easel and his model's on a platform.... His view of the model was thus from a lower angle, [as] seen in many of his paintings of the period, especially his advertising art for Mazda, Oneida, Holeproof Hosiery, etc. In many illustrations he also lights the models from a low angle getting an interesting shadow effect [as] in an ad illustration he painted in 1921 for National Mazda Lamp [that] is on page 105 of that book. "In that illustration, compare his treatment of the fringe on the dress with that on the wrap around the model's hips on the blotter. Also notice the pattern of that material. 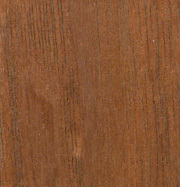 Phillips often used interesting material designs in his paintings. The model in his November 1914 cover for Good Housekeeping [wore] a robe with a very similar pattern to that on the wrap on the model in the blotter. ... Phillips normally did not cut off the lower body of the model but painted them full height, including shoes. He then normally signed his full length paintings with small, precise block lettering at the very bottom edge, or sometimes below the image. If the art director cropped the image to fit the blotter he would have cut off the signature." Additional comments and suggestions can be sent to Lighting A Revolution.